(Oddity Central) – You could say Zhao Rui, a young Shaolin monk from China, is rather thick-skulled. 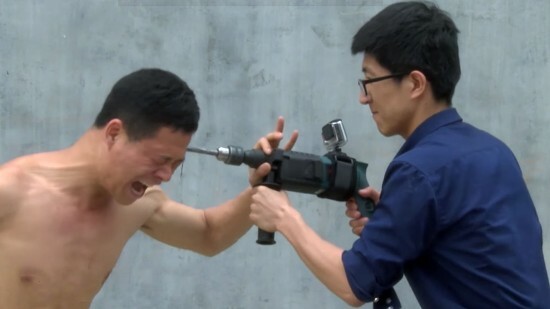 In a shocking video doing the rounds online, he can be seen holding a powerful electric drill to his head, without even breaking his skin, let alone fracturing his skull. The 24-year-old Kung-Fu master can also bend an iron bar against a wall with his throat, and lie on metal spears while stones are broken against his back. The recent display of Zhao’s skills was intended to show how he had trained his body during several years of martial arts training. He revealed that he was fascinated by martial arts as a child, and ran away from home to join a Shaolin Temple at age 16. He studied there for two years, after which he continued to learn kung fu from other masters. He is now a master himself.